Originally created as a way of informing people in La Plata County about the status of ridiculous road proposals that a County Commissioner and previous County Manager were pushing for in Horse Gulch, the primary goal of this blog WAS and IS that of keeping open-space land in and around the Gulch primitive. Horse Gulch as seen from Stacy’s Loop. Keeping locals updated about the threats of asphalt, cement, environmental waste and destruction, litter and urban sprawl in Horse Gulch continues to be this blogger’s focus. More recently, however, public officials have been quiet about the asinine road proposals mentioned in the 2030 Trip Report and the focus of this blog has shifted towards watchdogging over the use of public land in the vicinity of Horse Gulch, Durango and Grandview in general. Aside from Horse Gulch, this blogger has been trying to expose the waste and destruction associated with the Colorado Department of Transportation’s Grandview Interchange project and its Bridge to Nowhere. At the last public meeting for the unplanned US Highway 550/US 160 alignment in Grandview, several alternatives to CDOT’s preferred reroute were championed, and dissident voices were aplenty. The visual impacts that connecting US Highway 550 to the Bridge to Nowhere would have are staggering; a canyon will be dug out of Florida Mesa. At the same time, this blogger continues to sit in on Horse Gulch open-space management meetings held by the Natural Lands and Preservation Advisory Board as to keep readers informed about the Board’s quest to amenitize the primitive nature out of this wild land of easily-accessed solitude. A look at Horse Gulch and the Meadow from the north. Nestled in the mountains outside of Durango, Colorado, the Horse Gulch and its system of trails extending east towards the Grandview Ridge area provide epic views, solitude, and memorable recreational opportunities to those exploring on foot, bike or horseback. During the winter, much of the Grandview Ridge area provides an undisturbed resting and feeding area for deer and elk herds, as public entry is prohibited due to the BLM’s winter wildlife closure. For those who have been on these trails, you know how precious this area is with its unique topography, rock outcroppings, slanted ridgelines and diverse high-desert flora. Here in Durango we’ve been grateful to have had the opportunity to play on the trails crossing over Pautsky’s property for a long time. Our time of solitude on the trails in the Grandview Ridge area could be numbered and shortlasted, however. 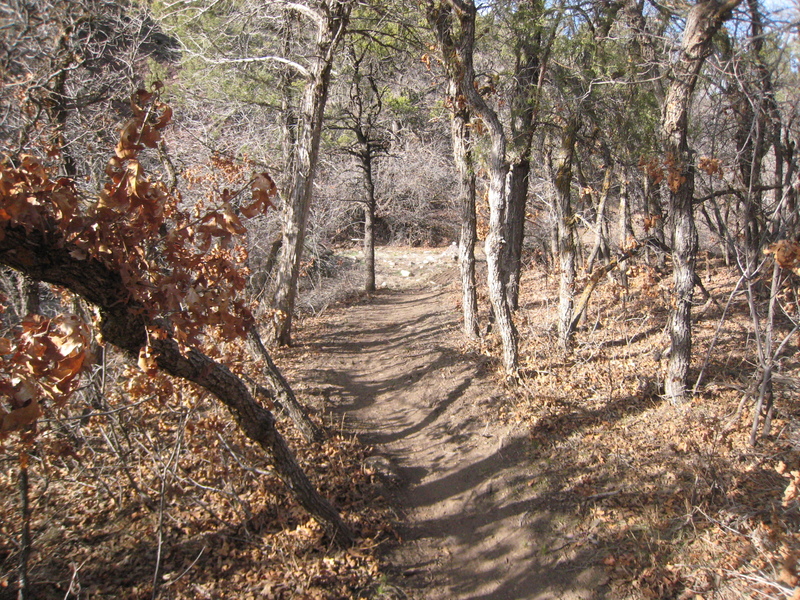 Big Canyon trail in the spring takes its sweet precious time greening up. 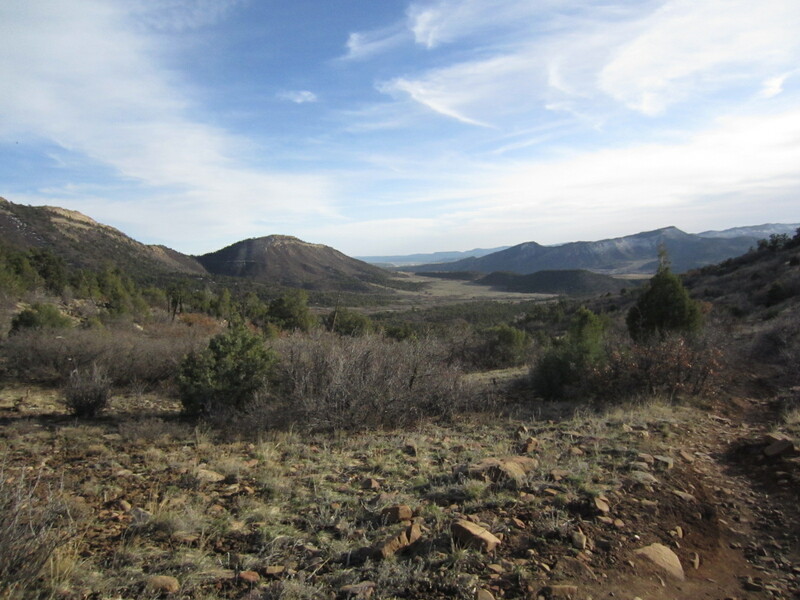 In Sept. of 2008, La Plata County Commissioner Kellie Hotter started a process of soliciting a right for an easement from Pautsky to build a road across BLM land and the trails we know as Carbon Junction, Big Canyon, Skull Rock Loop and Grandview Ridge. This process came to a point where attorneys from La Plata County and Oakridge Energy had drafted a letter of intent to grant La Plata County an easement for this road. The proposed road would cross over the Pautsky’s property, heading over trails and into the Grandview area near Mercy Medical Center. On January 26, 2010, the Board of County Commissioners approved the idea in a letter of intent, with Commissioners Wally White and Hotter voting for it, and Commissioner Joelle Riddle voting against it on grounds that the city wasn’t involved in an open and transparent fashion. A time frame for the construction of the Grandview connection of seven years was given by Pautsky, as part of the agreement, before the easement would terminate. In our current economic state the funding is unavailable, but funding could be available from the federal government or local property-tax-payers for this project in the coming months or years. It would cost $21.5 million dollars for the Grandview connection, another $14.8 million for the Ewing Mesa access from Highway 3, and another $6.1 million for the Ewing Mesa access from Dominguez Drive, according to the 2030 TRIP Report, which was drafted by La Plata County and the City of Durango in 2006. These costs do not include those of inflation or those of acquiring properties on High Lama Lane through annexation or outright condemnation proceedings. It would relieve congestion on US 160, thus giving CDOT less of a reason to build its proposed bridges for Three Springs Boulevard and Elmore’s Corner. It would give emergency responders one more option for faster access to Mercy Medical Center in the event of deadlock traffic on US 160 just west of the Grandview Interchange/Bridge to Nowhere. It would give Pautsky and her heirs an incentive to consolidate development on her property near the Ewing Mesa Road, encouraging her to once again seek out the rights for smaller parcels, something she abandoned in 2005 after a concerted and failed effort with city officials. Smaller parcels along the road would discourage development in the trail system, Nau and Hotter told me in an office discussion on January 15, 2010. Opponents of the proposed Grandview connection road include myself, a local resident, and many others living in and around Durango and La Plata County. Here are ten reasons to be against the proposed Grandview connection.